At Ward 3 alone, for example, there are about 40 or so beds, most of them occupied. Each patient has two charts—the blue and the red. The first is where the lab results are inserted; the second is where the doctors and nurses actually write. In a sense, one is fortunate to find the chart stacked in its proper shelf. The reality is that that at any given time, the resident, fellow, another fellow, nurse, or intern is browsing through it, writing orders, notes, and pertinent lab results. It is not surprising to spend thirty minutes to an hour looking for a chart. When one does not need it anymore, it becomes more available. I suppose this is what makes charts similar to taxis on a rainy night. While I was looking for my chart at the Nurses' Station, I met Schubert Malbas and Gideon Libiran, my dorm mates from way back at Kalayaan Residence Hall, UP Diliman, during my freshman year, aka one of the best years of my life. We lived at the Basement. And then it occurred to us: we should take a photo. 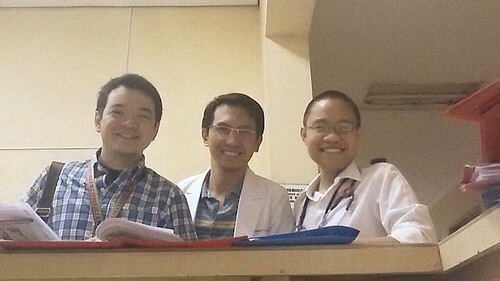 Who would've thought that after ten—no, 11—years, we will bump into each other again, this time as physicians?